Enjoy making boxed cushions for indoors and out. Chair seats, picnic pads, and scatter cushions are sewn by making boxed cushions. These can be made in any size, shape and depth you would like. A pattern can be made if you want to make one to help and for more intricate shapes then this would make sure all the seam allowances had been added. Then the finished cushion would be the size you want. There are a couple of different ways to make these cushions and the main difference is the way the gusset or welt is sewn in. When sewing the seams try to have the gusset on the underside and stretch this slightly while sewing. Doing this will give a tighter fit. Decide on your size and shape of your cushions. 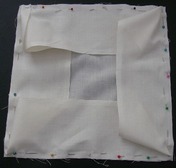 I have chosen a square, 12 inch (30.5cms) one, with a 2 inch (5cms) gusset. 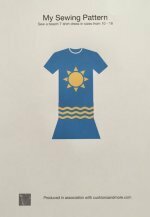 You can either make a paper pattern or just cut the material out to the required size. 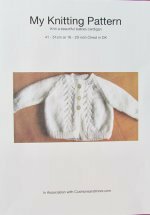 Remembering to add on the seam allowance, cut out your material so you have a front and back piece along with the piece(s) for the gusset. 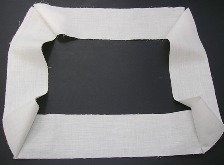 The gusset can be one continuous strip (for circular or square cushions). 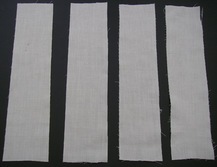 You will need to measure around the cushion to get the length of the continuous strip and may need to sew smaller strips together to get the desired length. This will result in seams being seen on the finished cushion. 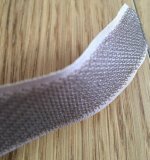 If you do need to add a little piece of material in order to make the continuous strip then try to put the seam at the back. 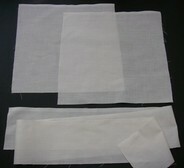 Another way to make the gusset is to cut 4 individual pieces (mainly for square). There is also a downside to using separate gusset pieces with seams at the corners and this will add extra bulk and may not look as smooth as you would like it to. Having decided about the type of gusset to use the next step is to make the gusset into one piece. The continuous strip end pieces need to be sewn together and if using separate pieces these will also need to be sewn into a square shape. Leave a gap at the end of the seams to allow for turning. Sew the gusset to the front piece of the cushion, you will need to snip the continuous strip gusset at the corners to allow for turning. Match the seams to the corners if using the four piece gusset. Sew the gusset to the back piece, leave a gap on the last side of the cushion to allow for the foam block to be inserted. Sew this seam approximately 1 inch (2.5cms)from either end as this makes the fastening easier to attached. Turn right side out and insert the foam block, this will have to be folded in half to get through the gap that had been left. The block should be the same size as the cushion cover. When the foam block has unfolded the material will stretch over it. Making boxed cushions a snug fit. All that is left now is the fastening, if you don't want the cover to be removable the gap can be slip stitched closed by hand.If the cover is to be removed then the gap can be closed with a ribbon fastening or little squares of velcro. I have found that making boxed cushions can be a bit difficult and it will be easier with practise. Try a different variation by making a circular one.